Budgeting for a Disney World trip is tricky. There is so much to keep track of: flights, resorts, dining, souvenirs. But one of the areas of budgeting that can cause some stress is knowing when to tip at Disney World. Even though there are lots of strong opinions about who and when to tip, there are some general tipping guidelines that we recommend following when vacationing at the Walt Disney World Resort. When you travel, you may have times when people help you with your bags. This is especially true if you fly. Mousekeepers are the hard-working housekeepers that keep your room clean and towels stocked. Since your Mousekeeper may not be the same every day, you should plan on tipping them $1-$2/person per day. Want a cute way to show your appreciation? Consider using one of these fun Mousekeeping tip envelopes. The standard tip for most areas of the U.S. is 15-20%, so you'll want to plan on tipping that amount when dining at any Table Service restaurant on property. To help you know how much and when to tip at Disney World, you'll see that Disney prints the tip amount for 18% and 20% of the total on your receipt. If you are on the Disney Dining Plan, your tips are not included and will need to be paid separately. You can pay your tips with cash, gift card, credit/debit card or you can charge them to your room. Buffets are considered Table Service and tips are still expected at those locations. Not sure how to budget for tips on the Disney Dining Plan? Check out the average cost of a meal at each restaurant to give you a rough idea. Dining with a group of 6 or more? You'll have an 18% automatic gratuity added to your ticket. Tips are included in your bill at a few locations. Cinderella's Royal Table, Hoop-Dee-Doo Musical Revue, Spirit of Aloha, and Mickey's Backyard BBQ all have the tip included in their prices. 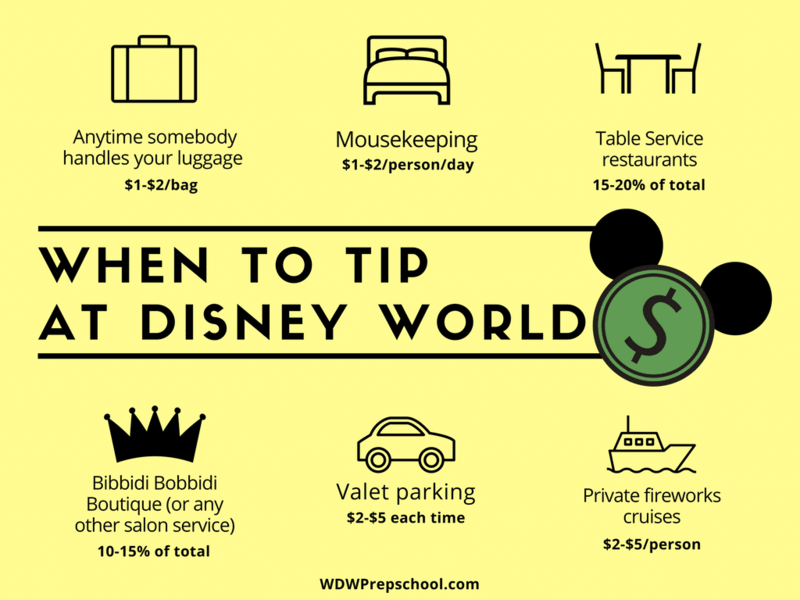 Just like you'd expect if you were getting a haircut at home, you'll want to plan on tipping at Walt Disney World, too. This includes Bibbidi Bobbidi Boutique, Pirates League, Harmony Barber Shop, and any of the spas and salons located in the resorts. If you plan on visiting any of those locations you'll want to budget 10-15% of your expected bill for a tip. Disney offers valet parking at all of its Deluxe Resorts as well as at Disney Springs. In most instances, valet parking costs $33/day. Guests with a valid handicap registration and those with a Tables in Wonderland card can valet park for free. All guests (whether you can valet for free or not) should plan on tipping $2-$5. Get more info on parking and driving at Disney World. The captains on the private fireworks cruises are also able to receive tips. Plan to tip them $2-5/person. Can I tip with a gift card? In some instances (like when you are dining), yes. But definitely not everywhere. It is best to keep some small bills on you if you know you'll be in one of the situations listed above. I had the best Cast Member at Dumbo. Can I tip them? In most cases (outside of the list above) Cast Members can't accept tips. However, they definitely can accept compliments. If you had an interaction with a Cast Member that went above and beyond consider thanking them in other ways than a tip. What about my bus driver? Monorail and bus drivers should not be tipped, but if you have a great experience you should definitely leave them a compliment at Guest Services. I am not sure if I can tip this Cast Member. What should I do? Ask them! There are other situations where you may have an interaction with a Cast Member that can be tipped so it is always good to ask. Concierge Desk Cast Members, golf caddies, fishing boat captains - these are all Cast Members that can receive tips so when in doubt, ask! 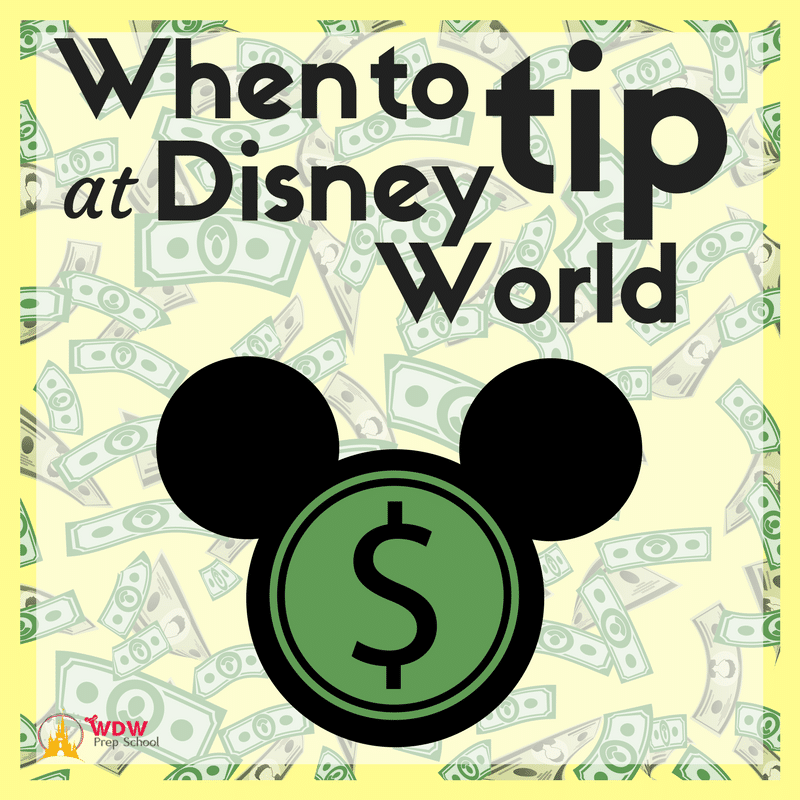 Have any other questions about when to tip at Disney World? Let us know in the comments . Disney specifically tells their British guests that mouse keeping is not a tipped post but is welcome for “excellent service”. As the person might change daily, I’ve never been sure how that is supposed to work. You say The Spirit of aloha and Royal table tips are added into the price already. How does that work with he dining plan? They’ll ask you how you’re paying, you’ll tell them you’re on the Disney Dining Plan, and then when the check comes you won’t need to add a tip. When we tried to tip bell services at our hotel, we were told they couldn’t accept a tip. Weird! I’ve never not tipped bell services. It made me feel guilty as they had been moving our bags in that heat. I also tip the Magical Express drivers and always offer for any tours we take. 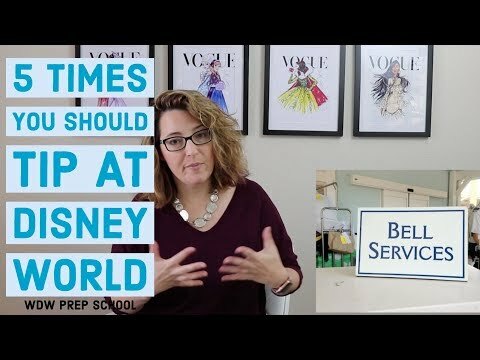 Yes I agree with all of these but, you should probley tip all Cast Members who help you or who are nice and gave you a magical day! As the article mentions, most Cast Members can’t accept tips, so it’s good to know who does so you can plan ahead. What if you do one of the special park tours that Disney offers? Do you tip your guide? How much? We are doing a tour which costs $249/person. Your guidance would be appreciated. Thanks. What about Minnie Vans? When they first started the Minnie Van service I had heard that it was not a tipped position. I thought I read somewhere recently that this has changed. This is true. They started as a position that could not accept a tip, but now guests are allowed (and encouraged) to tip Minnie Van Drivers! Lyft, I was able to easily add a tip with my credit card that was on file.